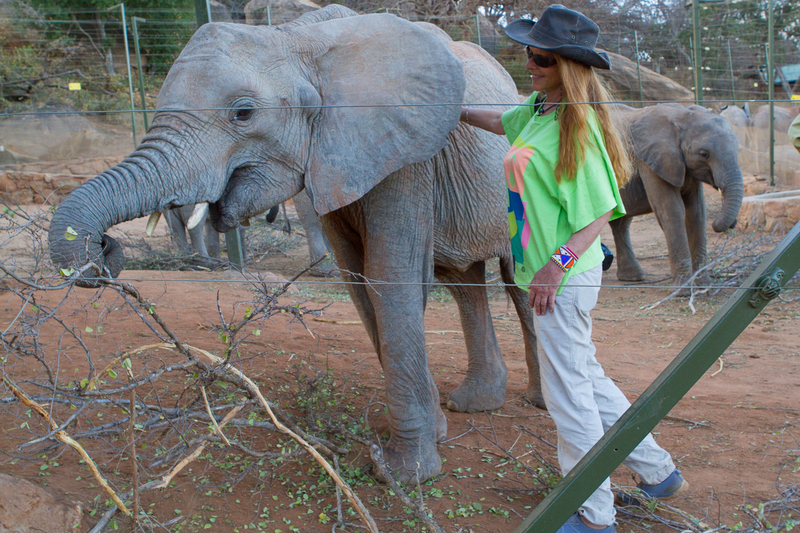 In Kenya, I had the privilege of staying at Itumba, the bush camp of the David Sheldrick Wildlife Trust (DSWT). After years of capturing images of people from the remote corners of the world, I am now exploring the endangered species of the Animal Kingdom. 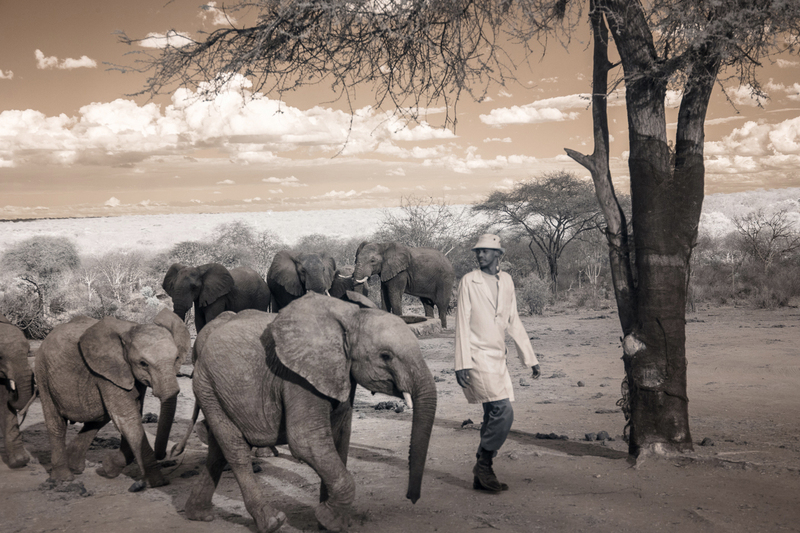 The opportunity to interact with the orphan elephants in Itumba Camp in Tsavo East National Park is an elephant-lover’s dream. At Itumba, you have the unique opportunity to interact with young elephants who trust humans during their transition towards a life in the wild. Wild elephants also join in, mixing with the orphans and tolerating our human presence. 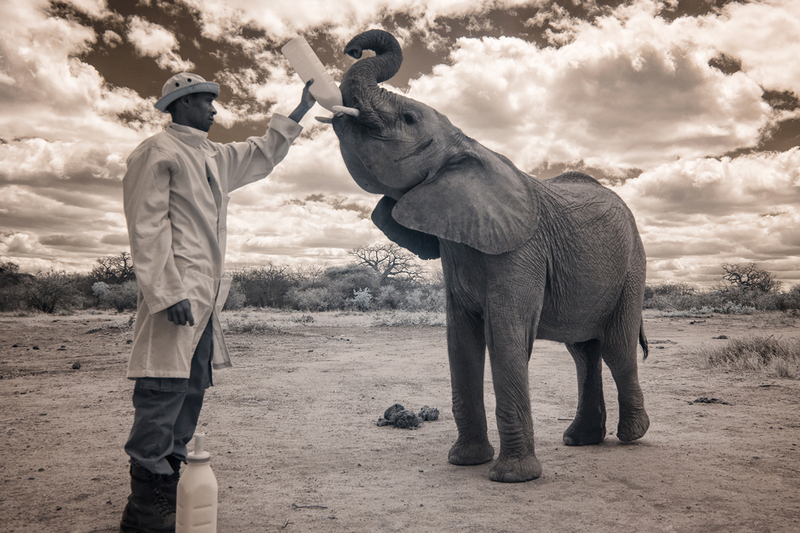 Itumba has had extraordinary success in rehabilitating and releasing elephants. 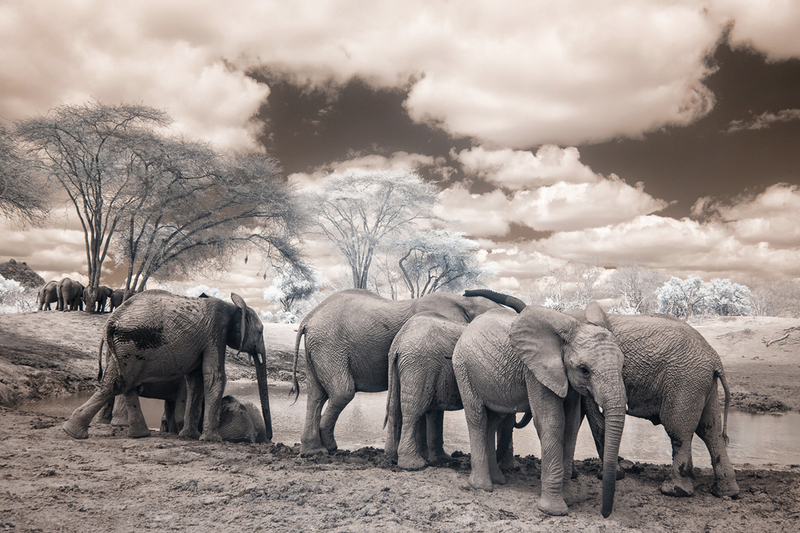 It plays an important role in elephant conservation in Kenya. Benjamin Kyalo, the head keeper tells us the orphans communicate with the wild elephants and let them know it is safe and okay to be here with humans. While at Itumba, I became involved with the adoption program and chose Laragai for my adoptee. She is a young female rescued by the staff at a lodge in Northern Kenya. When Laragai was rescued, there were many herds in the area. The rangers waited a couple of days after finding her and observed that her condition was worsening. They concluded that she was abandoned. The rangers managed to subdue her and brought her to the lodge to await the help of the DSWT Rescue Team. The DSWT Rescue Team and the new orphan arrived at the Nairobi Nursery in the late afternoon after a successful plane journey. She was soon safely relocated to a comfortable stockade next to Sities, an older orphan who was a soothing presence to the newcomer who needed all the reassurance she could get. Laragai was in a wild and emaciated state, but she took milk from a bucket during the night, and from a bottle the following morning, though only behind the security of the stockade gate. Laragai took much longer than usual to tame, despite the keepers’ best efforts. Once the elephants are a little older, they are ready to be transferred to one of the two relocation centers in Kenya to ease their transition back to the wild. It is like when your child graduates from nursery school to kindergarten. Itumba is one of these centers. 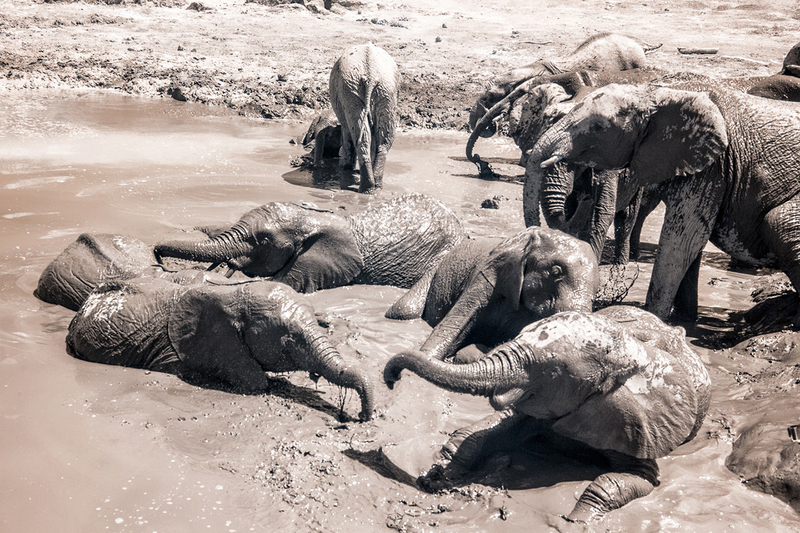 On our arrival at Itumba, we went immediately to the mud baths to meet the orphans and ex-orphans (that is, those orphans that no longer require milk – usually at 8 years old the elephants no longer need to take milk or return to the stockades at night for protection). Suddenly, your ears are met with the trumpeting of a herd of elephants coming straight towards you, ravenous for their morning milk feeding. And then there are the mud baths. It is like watching extremely large kids go crazy in a sandbox. Our three days at Itumba were amazing. We observed the older orphans and their wild elephant companions, fed them milk, played with the babies, and were physically pushed around by the enormous animals. This is what you come here for. Being surrounded by these gentle giants for even a short time is a magical and unforgettable experience. 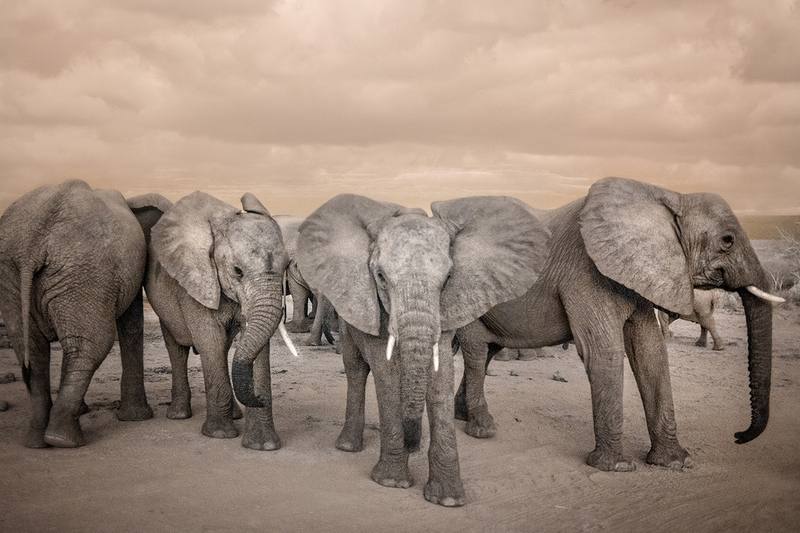 Elephants, more than any other species of wild animal, need room. The Tsavo National Park is the only park in Kenya large enough to accommodate them. Nothing in nature stays the same. Elephant numbers are designed by nature to fluctuate in unison with the nature’s own cycles. They are highly intelligent,­­­­­­ sophisticated, long-lived animals with an emotional make-up and sense of self, family and even death that are akin to our own. One of the world’s most pressing environmental problems is species extinction. 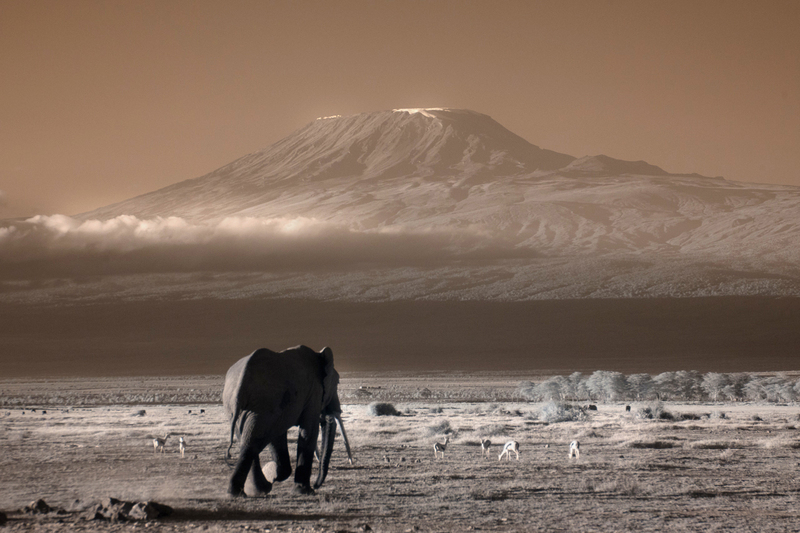 The survival of the African Elephant as a species presents one of the greatest challenges today. 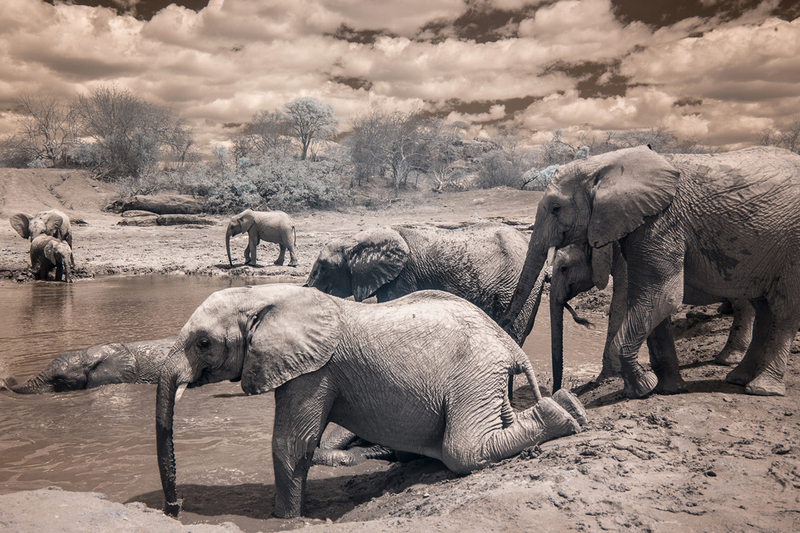 This entry was posted in Africa, Artists, digital Infrared, For Photographers, Infrared Imagery, Kenya, Tribal Culture and tagged David Sheldrick Wildlife Trust, Itumba. Bookmark the permalink.